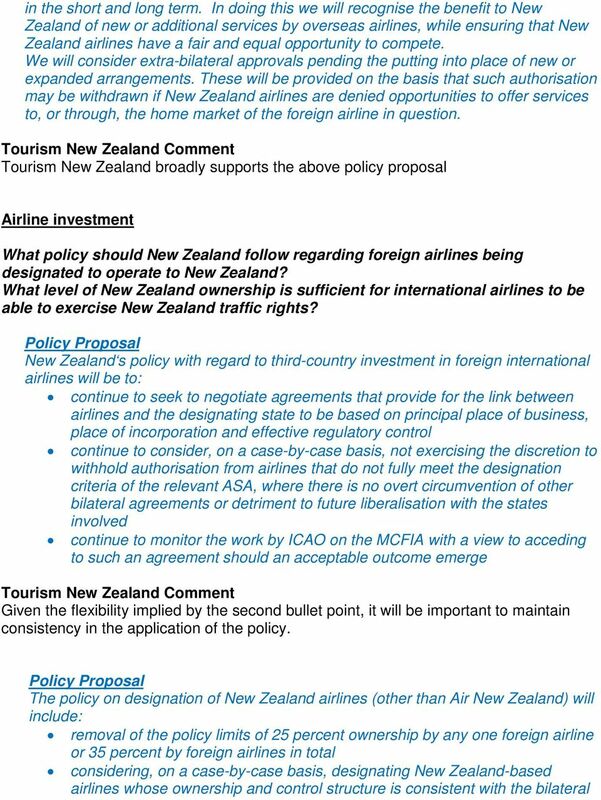 Download "New Zealand s international air transport policy discussion document - Tourism New Zealand comments"
4 The negotiation programme will prioritise relationships where unavailability of rights is preventing airlines from offering services. The aim will be to have arrangements in place ahead of demand. A short and medium term focus will be on negotiations within East Asia and South America in line with negotiating mandates already granted by Cabinet. Other mandates will be progressed over the medium term. We will also continue to monitor developments in Europe with a view to assessing when resumption in negotiations with the European Commission might prove desirable. Longer term negotiating priorities will shift in line with commercial and aero-political developments. The Ministry of Transport will also monitor air transport policy changes in other countries to identify liberalisation opportunities. 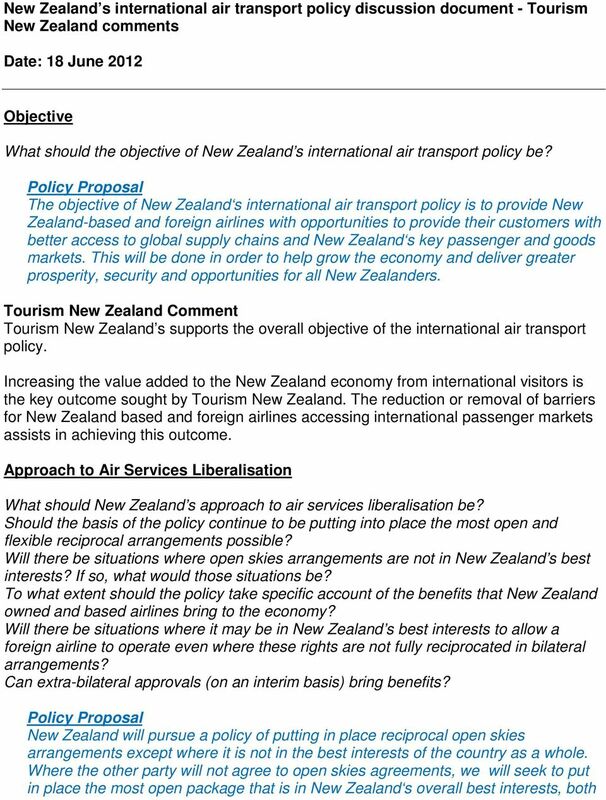 Stakeholder input on negotiation priorities The government will develop mechanisms to allow more systematic engagement with a wider range of stakeholders, including airlines, airports, and tourism and freight interests, on determining priorities and approaches in future years. South Pacific New Zealand is aware of the particular air transport needs of the Forum Island Countries, and in particular the need for further development of air transport links and infrastructure, and will continue to maintain a flexible and positive attitude in the negotiation and implementation of air services arrangements with them. 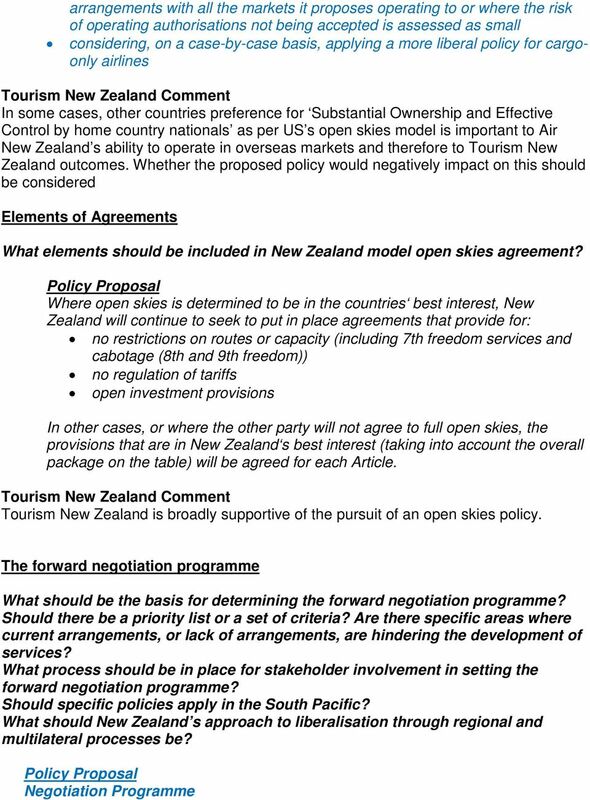 Multilateral and plurilateral negotiations The New Zealand government intends to continue to engage in multilateral and regional initiatives where these are consistent with the thrust of this policy. 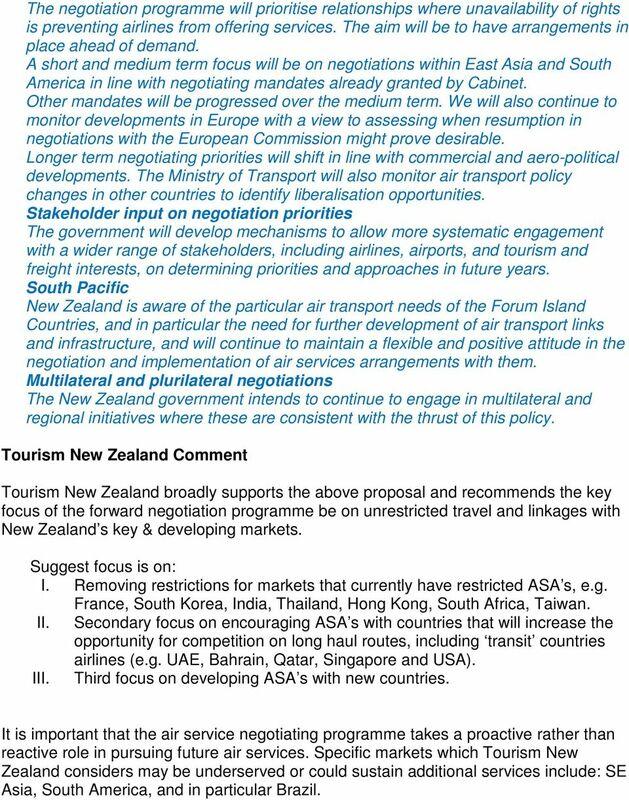 Tourism New Zealand broadly supports the above proposal and recommends the key focus of the forward negotiation programme be on unrestricted travel and linkages with New Zealand s key & developing markets. Suggest focus is on: I. Removing restrictions for markets that currently have restricted ASA s, e.g. France, South Korea, India, Thailand, Hong Kong, South Africa, Taiwan. II. Secondary focus on encouraging ASA s with countries that will increase the opportunity for competition on long haul routes, including transit countries airlines (e.g. UAE, Bahrain, Qatar, Singapore and USA). III. Third focus on developing ASA s with new countries. It is important that the air service negotiating programme takes a proactive rather than reactive role in pursuing future air services. Specific markets which Tourism New Zealand considers may be underserved or could sustain additional services include: SE Asia, South America, and in particular Brazil.